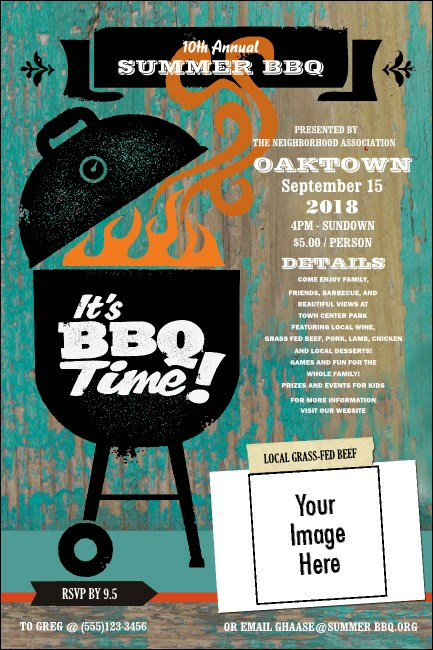 Set the perfect temperature for your BBQ event promotions when you advertise in advance with BBQ Kettle Grill Posters. These Posters are fun for the whole family and feature a black kettle grill and orange flames shooting from the top, with the phrase “It’s BBQ Time!” on a distressed turquoise background. You can even upload your own unique image to the template. TicketPrinting.com has all the fixin’s for great pre-event advertising.